DE'VO'S LEGENDARY BLADES SERIES JUST GOT A SERIOUS UPGRADE! The Master Series - De'vo's Blades Blood Moon has beautiful luxurious RED METALLIC INK (not shown in photos -- prototypes have standard ink) on the faces and backs. This is a first for ANY De'vo deck! 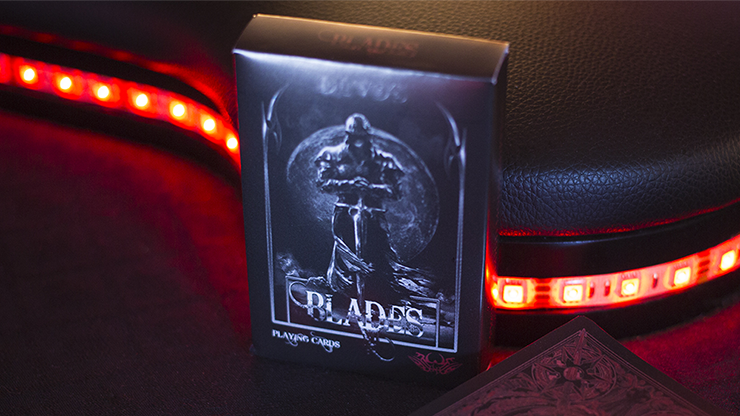 This amazing deck is a black deck and a MUST HAVE for all card lovers! This is the same series that has been seen all over television and used by world-renowned card experts and magicians! This time De'vo has outdone himself by doing this all-black deck version with a beautiful red metallic ink. Printed by the USPC with intricate artwork, world class stock and finishes. It is perfect for playing cards, magic, XCM, cardistry and for collecting. This deck includes two amazingly illustrated Jokers (big and small) AND a blank card which can be used by magicians to make the entire deck look blank at will. You may have seen De'vo's previous decks on Stan Lee's Superhumans, on Dude Perfect with Rick Smith Jr. (over 90 MILLION VIEWS), and on many other television shows! De'vo's decks have also appeared in many shows used by a variety of professional magicians and card manipulators. De'vo's decks are some of the most sought-after cards in the world and are in the homes of presidents and celebrities around the globe. This brand new, HOT offering from De'vo has gorgeous and expensive red metallic ink on both faces and backs. De'vo's decks handle like no other and are WORLD CLASS! They are simply incredible and look elegant but have a dark and classy feeling to them! There is nothing else quite like this amazing deck of cards! These are PERFECT for card collectors, poker/game players, magicians and manipulators who want a beautiful and BOLD deck of playing cards! If you even remotely like playing cards, then you NEED this deck in your collection before they are gone forever! NOTE: All deck photos are of the prototypes and do NOT have metallic ink, but the final product will.